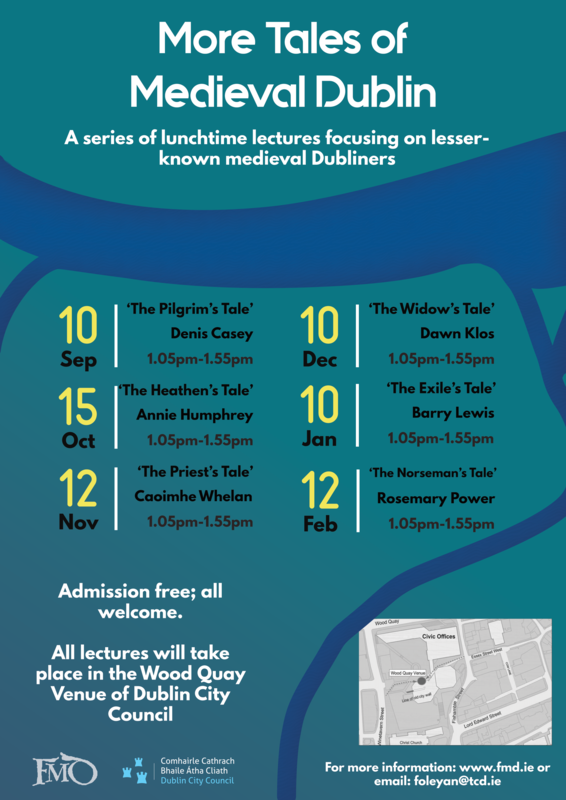 The Friends of Medieval Dublin in conjunction with Dublin City Council run a series of monthly lunchtime lectures from June to December held at the Wood Quay venue against the unique backdrop of a stretch of the original Hiberno-Norse wall dating from the 12th century. Our sensational lunch-time lecture series returned in 2017. Starting in the autumn and running through the spring, this series focuses on a whole new set of medieval Dubliners. From skulls to sheriffs and tanners to brewers, these talks should interest fans both new and old. All lectures take place from 1.05-1.45pm and are held at the Wood Quay Venue. 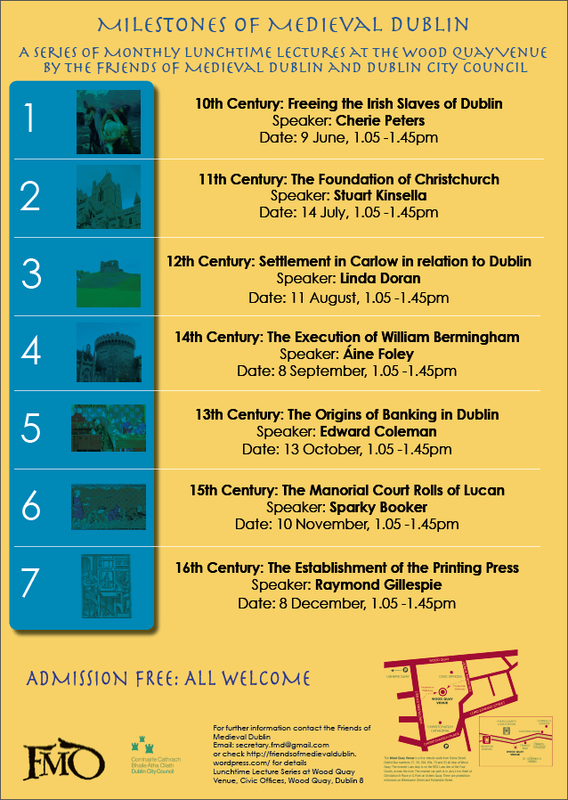 In this lunchtime lecture series renowned experts will explain just how medieval Dubliners survived invasions, battles, famines and plagues. This is a unique opportunity to discover how events like the arrival of the Vikings and the English (who built Dublin Castle) helped shape our city. All lectures take place from 1.05-1.45pm and are held at the Wood Quay Venue. In the decade of commemorations, the Friends of Medieval Dublin organised a lecture series commemorating the millennium of the Battle of Clontarf. An infamous battle, fought on Good Friday, 23 April 1014, between Brian Boru and his Munster forces against Dublin and their Leinster and Hebridean allies. 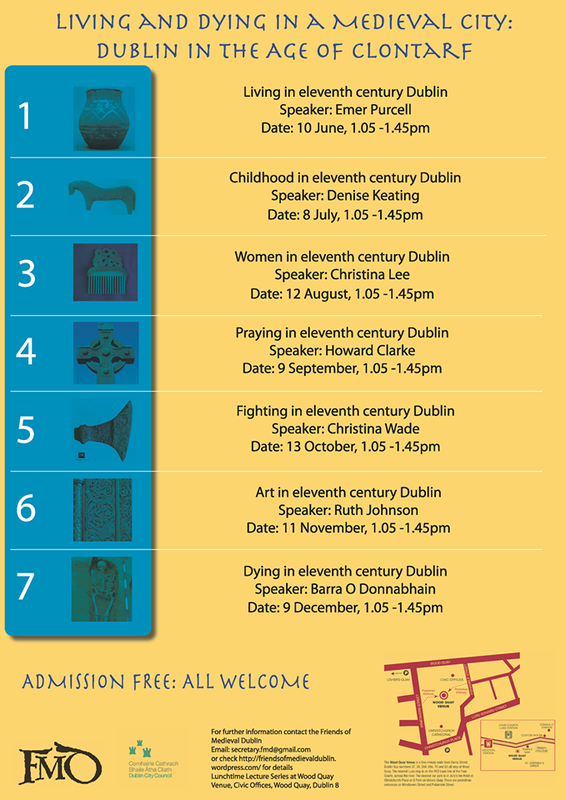 This lecture series focused on the daily life of eleventh-century Dublin and explored how every-day Dubliners lived, worked, prayed, fought and died. This series has now finished. This lecture series ran from June 2010 until December 2012. Focusing on lesser known individuals this series – and the resulting volume Tales of Medieval Dublin (published 2014) – provided a chance for modern audiences to meet the extraordinary citizens of this colorful medieval city and to hear their stories. 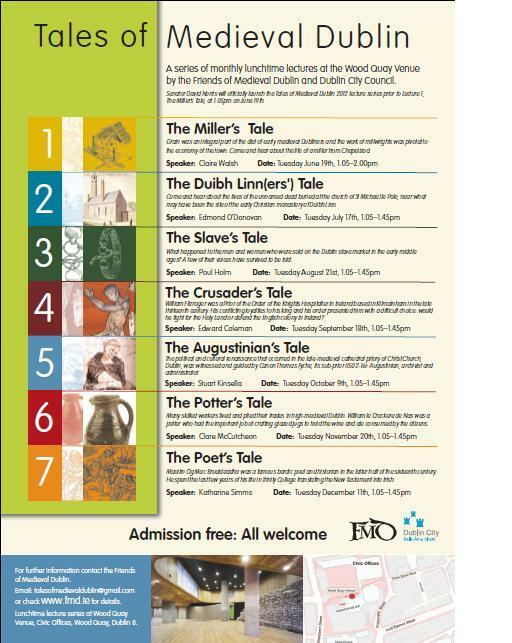 This series has now finished, but you can purchase the resulting volume, Tales of Medieval Dublin, at Four Courts Press!